Welcome to my Cody, Wyoming private practice and Lokahi Wellness Center! My specialty is integrative therapies with a growing specialty in neurotherapy and biofeedback, combined with psychotherapy. For the last 6 years the LENS neurofeedback has been shown incredible results for many physiological, neurological and emotional issues. Recent additions in neuromodulation therapy issues include qEEG Brain Mapping, Z-Score Neurofeedback , Neurofield PEMF therapies, and Bioresonance Pulsed EMF Therapy. We collaboratively develop a treatment plan to address issues and symptoms that may be chronic and impact daily functioning. Your therapeutic process moves quicker and efficiently if you’re central nervous system is more regulated. I can help you create an alternative plan of action to manage issues such as anxiety, trauma, chronic pain, fibromyalgia, grief, depression and whatever else life might throwing your way. Let’s work together to find effective strategies to create the experience you want in your everyday life. Let’ s help you activate full potential to get recalibrated into a better feeling frequency. Find the most effective ways to integrate more effective and sustainable strategies into your daily life. I can help you be and feel the best you can, to be the best in your best life. As always I do offer some individual and couples psychotherapy services, with limited availability. It is advisable to request to be added to my wait-list for psychotherapy services way in advance. I am streamlining into more of a coaching model and will be prioritizing coaching packages as my online services expand as well. Join me for an active healing process for help with issues such as anxiety, depression, trauma, chronic pain, fibromyalgia, cancer, and many other issues. I have a unique model of healing and wellness and look forward to sharing with you. Let’s help your brain and nervous system regulate itself better with the LENS Neurofeedback System, HRV Biofeedback or PEMF Bioresonance technology. Incredible alternative treatment options for anxiety, depression, fibromyalgia, trauma, chronic pain, and anything nervous system based. I offer unique and structured treatment plans that will help you function and feel better sooner. Now offering qEEG , Brain Mapping for complete Neurotherapy services. Schedule a consultation and see how Quantitative EEG technology can identify your specific brain wave patterns and assess how your brain is functioning. Let’s talk about treatment options for old concussions, traumas, developmental issues and many other symptoms. 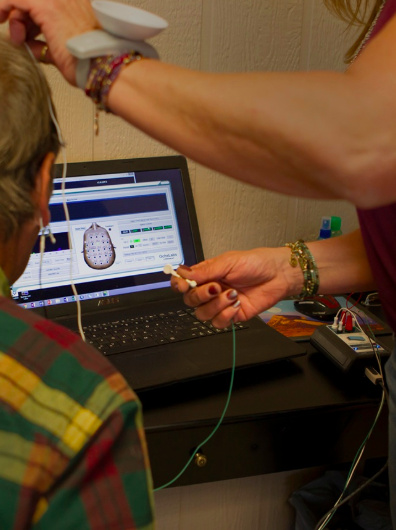 Discover the latest treatments in neurofeedback and neurostimulation therapies. Neuroscientists have discovered that physical brain structures change over time. Because of this neuroplasticity, we don’t have to be stuck with old neural pathways which once defended against trauma or stress. The Low Energy Neurofeedback System (LENS) helps our brain be more flexible by safely addressing the brain in its own electromagnetic language. The LENS can encourage improved memory, mood and overall functioning. The LENS is a specific kind of Neurofeedback that operates much more rapidly than traditional Neurofeedback and has qualitites that make it much easier to use with people who can’t sit still. With the LENS, the client doesn’t need to “do” anything, and there is nothing to learn. The typical session with the LENS lasts 3-4 minutes. This means that the LENS works well for people who either cannot or will not pay attention to a computer screen for longer time periods. Additionally, the LENS works much faster than traditional Neurofeedback with the number of sessions ranging from as few as 1 to an overall average number of 20 sessions. These are all signs of Central Nervous System dysfunction which result in the body’s difficulty regulating itself. At times there are unknown issues such as early-stage degenerative diseases, allergies, strong reactions to some foods or pollens, or spills and falls leading to bumps on the head. In these instances longer courses of the LENS may be needed. And it may also be that some direct medical help may be the best course of action. Fill out the form to your best ability and I will be in contact with you. Please expect a thoughtful response within 24-48hr of normal business hours. ADDRESS: 2610 Big Horn Ave.
Lokahi Wellness is a gathering space that offers a full spectrum of services with an emphasis on complementary therapies, energy medicine and spiritual education. Experienced Healers and Professionals who have worked and traveled across the globe to bring clinical practice, ancient techniques and new technology together.